The invention relates to a surface-modified effect pigment comprising particular additives and to the production thereof. The present invention further provides a nail varnish composition comprising a) at least one effect pigment that has been surface-modified with a starting material (additive), where the effect pigment comprises a substrate in platelet form and optionally at least one coating applied to the substrate, b) at least one hydrocarbon resin as binder, and c) at least one solvent or solvent mixture, where the starting material (additive) for surface modification of the effect pigment is at least one compound taken from the group consisting of phosphoric ester-containing, phosphonic ester-containing, phosphonic acid-containing, fatty acid-containing and/or silane-containing compounds or mixtures thereof. The present invention relates to a surface-modified effect pigment and a process for producing the same as well as nail polish compositions containing said surface-modified effect pigment. EP 1812518 A2 discloses pearlescent pigments, which are provided on the surface with at least one phosphorus-containing compound. The pearlescent pigments are particularly suitable for use in powder coatings. Metallic effect pigments, wherein the surface of the metal oxide has at least a fluoroalkyl and / or fluorarylhaltiges surface modifier or covalently bonded polysiloxane. The metallic effect pigments, especially in powder coatings for use. Metallic effect pigments, wherein the surface of the metal oxide covalently bonded polysiloxane has. The metallic effect pigments are particularly suitable for use in powder coatings. EP 2576702 A1 relates to the use of surface-modified effect pigments, in particular in powder coatings. The effect pigment surface is surface-modified with at least one epoxy group-containing compound herein. Adhesive layer for fixing the article on a fingernail, at least one organic film and at least one, responsible for an optical effect, for example, component. The latter can for example serve to give a mirror effect the flexible products. Noble metal particles having an average particle size of 10 to 100 nm in a proportion of 5 to 50 wt .-%, based on the total weight of the nail varnish contains. EP 1796794 A1 discloses a cosmetic composition comprising a PVD aluminum pigment in a pigmentation level of 0.05 to 5.0 wt .-%, based on the total weight of the cosmetic composition, and at least one leafing additive. When leafing additive long-chain phosphoric ester or a mixture of more long-chain phosphoric acid esters are used. In most nail polishes, however, the leafing effect does not come into its own. EP 1082952 A1 discloses a cosmetic composition, for example a nail varnish comprising metal-coated glass particles. JP 2012081236 A discloses the mounting of a mirror to a finger nail. surface-modified effect pigments as colorants are used. The object of the present invention is to provide an effect pigment for use in a nail varnish composition, which determines the optical appearance of the nail polish composition according to application and drying significantly. Carbon chain from a range of Cs to C 4 in a proportion selected from a range of 15 wt .-% to 43 wt .-%, based in each case, based on the total weight of the silver-coated glass plate. using as starting material (additive) for the surface modification of the effect pigment, at least one compound selected from the group consisting of phosphoric acid ester containing phosphonsäureesterhaltigen phosphonic acid, fatty acid-containing and / or silane-containing compounds or mixtures thereof, is removed. Preferred developments of the nail polish composition are specified in the Claims 5 to 15 °. Use of a surface-modified effect pigment according to claim 1 or 2 in nail varnishes. comprise metal oxide-coated metallic platelet-shaped substrate or an optionally coated with at least one metal oxide, metal and / or metal oxide non-metallic platelet-shaped substrate. The metallic platelet-shaped substrates can be made using conventional wet or dry milling or PVD method. platelet-shaped substrates from the group consisting of aluminum flakes, copper flakes, zinc flakes, iron flakes, stainless steel flakes, alloys and mixtures of the above-listed metals selected. The aforementioned metallic platelet-shaped substrates may also have one or more layers of or with at least one high and / or low-refractive metal oxide, metal and / or metal oxide hydrate and optionally dried and / or, optionally, calcined. Thus, commercially available coated metallic effect pigments can be used as metallic platelet-shaped substrates so. According to a preferred embodiment of the present invention to use metallic platelet-shaped substrates are not coated. the above-listed metals zinc flakes, alloys and mixtures selected. Aluminum flakes are particularly preferably used as a metallic platelet-shaped substrates. Further preferred are aluminum flakes prepared by PVD process. According to a preferred embodiment, the metallic platelet-shaped substrates PVD pigments, especially aluminum-PVD pigments. These preferably have an average thickness h 5 o from a range of 13 nm to 80 nm, more preferably from a range of 13 nm to 60 nm, and more preferably from a range of 20 nm to 40 nm. Aluminum pigments too dark and too transparent. Aluminum plate, at. In a preferred embodiment, the aluminum flakes further have a mercury content of preferably <1 ppm, an arsenic content of preferably <2 ppm, a lead content of preferably <10 ppm, a cadmium concentration of preferably <1 ppm, a barium content of preferably <10 ppm, a chromium content of preferably <20 ppm, a nickel content of preferably <20 ppm, a copper content of preferably <20 ppm, a cobalt content of preferably <20 ppm, an antimony content of preferably <2 ppm, a selenium content of preferably <10 ppm and a zinc content of preferably <20 ppm. <2 ppm, and a selenium content preferably of <10 ppm. The main claim of EP 1 251 152 A1 prepared. In another embodiment, the usable as metallic platelet-shaped substrate aluminum or Aluminiumlegierungsplattchen according to the main claim of WO 96/38505 A1 are wet chemically oxidized, and optionally comprise a high refractive metallic chalcogenide according to the main claim of the WO 2005/049739 A2. to use nail polish composition surface-modified effect pigments commercially available leafing aluminum effect pigments, such as Eterna British Premier 251, Eterna British Premier 255 or Eterna British Premier 351, respectively Messrs. Silver Line. WO 2010/086165 A1, for example METALURE A41010 AE, METALURE A41506 EN, METALURE A 41510 EN, METALURE A31017 AE, METALURE A31010 BG, METALURE A31010 AE, METALURE A21010 AE, METALURE L55350AE, METALURE L63418, METALURE L 55700, METALURE A 61010 BG, METALURE A61010 AE, METALURE A61006 AE, METALURE A61006 BG, BG METALURE A41010 or METALURE L7101 1 AE, all colors. ECKART GmbH. Cumulative distribution curve of the thickness distribution understood, unless otherwise specified. The determination of h o 5 was preferred according to the WO 2004/087816 in the A2 (pages 24 and 25) the method described by SEM. Thickness distribution of the metallic platelet-shaped substrates 1 1% to 98%, preferably 22% to 78%, particularly preferably 28% to 68% and most preferably 34% to 64%. The relative standard deviation in [%] is the quotient of the calculated standard deviation of the thickness distribution and medium thickness h 5 o. According to the invention, preferably to be used in a nail varnish composition, surface-modified effect pigments based on metallic, non-coated, platelet-shaped substrates may optionally have at least one layer composed of or containing at least one metal oxide, metal and / or metal oxide hydrate, wherein the metal ion selected from the group of metals, of Al, Si, Sn, Zn, Ti and Fe, preferably selected from the group de metals consisting of AI and Si is composed. Metal oxides listed above, metal hydroxides and / or metal oxide hydrates can mixed metal oxide, mixed metal hydroxide and / or mixed metal oxide, or (iii) are present in separate layers on the metallic platelet-shaped substrate as separate (i) layers (ii). According to the invention, preferably to be used in a nail varnish composition, surface-modified effect pigments based on platelet-shaped substrates metallic any average particle size D o 5 may have. The D 5 o values of the present invention, preferably to be used in a nail varnish composition, surface-modified effect pigments based on metallic platelet-shaped substrates are preferably in a range of 2 μηη to 150 μηη, more preferably μηη in a range from 2.5 to 170 μηη further preferably in a range of 3 to 140 μηη μηη, particularly preferably in a range of 3.5 μηη μηη to 90 and most preferably μηη in a range from 3.8 to 56 μηη. Extremely preferably, the present invention, preferably to be used in a nail varnish composition, surface-modified effect pigments based on metallic platelet-shaped substrates has a D 5 o-value from a range 2.5 μηη to 14 μηη or from a range of 15 μηη to 35 μηη on. Under 2 μηη the gloss values ​​decrease significantly and above 150 μηη not obtained uniformly closed metallic surface. Wet milling are produced and an average thickness h 5 o below 100 nm, a D 5 o-value from a range of 8 to 25 μηη μηη on. The Dio values ​​of the present invention, preferably to be used in a nail varnish composition, surface-modified effect pigments based on metallic platelet-shaped substrates are preferably in a range of 1 μηη to 60 μηη, more preferably μηη in a range of 2 to 40 μηη, particularly preferably in a range of 4 to 31 μηη μηη and very particularly preferably in a range μηη 5-19 μηη. Below 1 μηη the gloss values ​​decrease significantly and above 60 μηη not obtained uniformly closed metallic surface. The Dgo values ​​of the present invention, preferably to be used in a nail varnish composition, surface-modified effect pigments based on metallic platelet-shaped substrates are preferably in a range of 10 μηη to 600 μηη, more preferably μηη in a range of 30 to 200 μηη, particularly preferably in a range from 40 to 150 μηη μηη and most preferably μηη in a range from 45 to 120 μηη. Below 10 μηη the gloss values ​​decrease significantly and above 600 μηη not obtained uniformly closed metallic surface. In a further embodiment, the present invention, preferably to be used in a nail varnish composition, the surface-modified effect pigments based on metallic platelet-shaped substrates have an aspect ratio, defined as the quotient of D 5 o and mid-thickness, preferably from a range of 10 to 2000, more preferably from a range 30-1200, more preferably from a range from 100 to 1100 and most preferably from a range of 200 to 1,000. Below the lower limits of the optical properties of metallic effect pigments are not sufficient to achieve a specular gloss and above 2,000, the metallic effect pigments are very difficult to produce. surface-modified effect pigment, so metallic platelet-shaped substrate plus plus optional coating surface modification understood. In a preferred embodiment of the invention comprise, preferably to be used in a nail varnish composition, surface-modified effect pigments prepared as a metallic platelet-shaped substrate metal plate by a PVD method using a D 5 o-value from a range of 2.5 μηη to 90 μηη, more preferably from a range of 8 μηη μηη to 25 and an average thickness in a range from 13 nm to 60 nm. In this embodiment, the aluminum plates are preferably not beschichtetet. Present on aluminum flake natural oxide layer is in this case not be understood as applied coating. Surprisingly, mirror gloss effects with very small PVD pigments can be achieved. These pigments can be prepared, for example, by further grinding ordinary PVD pigments or crushed by ultrasound. Particularly preferably, these metal plates are aluminum plates. Particularly preferably, these aluminum-PVD pigments have a D 5 o-value from a range of 6 to 18 μηη μηη and an average thickness in a range from 14 nm to 40 nm. Very particularly preferred are aluminum-PVD pigments with a D 5 o-value from a range of 7 to 16 μηη μηη and an average thickness in a range from 15 nm to 35 nm. in particular aluminum flakes are used which have a similar average thickness as PVD pigments. Aluminum platelets with an average thickness h 5 o from a range of 20 to less than 100 nm and most preferably an average thickness h 5 o from a range of 25 to 60 nm. With such a metallic effect pigments also mirror gloss effects can be achieved if metal pigments produced by PVD processes deliver the very best results right in the rule. Glass flakes, Si02 flakes, A OSS platelets and mixtures thereof, selected. the non-metallic platelet-shaped substrates from the group consisting of natural mica flakes, synthetic mica flakes, glass flakes, and mixtures thereof are particularly preferably selected. Very particular preference as non-metallic platelet-shaped substrates synthetic mica flakes and / or glass flakes. In particular, glass slides are preferred as the non-metallic plattchenformiges substrate. made of lead crystal glass, E-glass, A-glass, C-glass, ECR-glass, Duran glass, window glass, laboratory glass, aluminosilicate glass or borosilicate glass. Preferably, the glass flakes have a composition according to the teaching, in particular according to the main claim, EP 1980594 B1, particularly preferably according to the teaching, in particular according to the respective main claim, the EP 1,829,833 B1 or EP 2,042,474 B1, to. The preparation of the usable as non-metallic platelet-shaped glass flake substrate is preferably carried out by the method described in EP 289 240 B1 process. In one embodiment the glass flakes can be specifically stained by the addition of at least one inorganic coloring agents in their manufacture. Suitable colorants are those that do not decompose at the respective melting temperature of the glass composition. The proportion of the colorant is in this case preferably in a range of a total of 0.1 wt .-% to 20 wt .-%, particularly preferably in a range of a total of 0.2 wt .-% to 15 wt .-% and very particularly preferably in a range of a total of 0.5 wt .-% to 10 wt .-%, each based on the total weight of the glass composition. Suitable coloring agents are, in particular elemental noble metals such as Au, Pd or Pt, the cations or complex anions of the elements Cu, the colorants listed above, Cr, Mn, Fe, Ti and / or Co and mixtures thereof. Silicon hydroxide, silicon oxide hydrate comprising or consisting be coated. Glass flakes, the glass surface will be protected against chemical modification, such as swelling, the leaching of glass constituents or dissolution in aggressive acidic coating solutions. The usable as the non-metallic platelet-shaped substrate of synthetic Glimmerplattchen may have a composition according to the main claim of the CN 102718229 A or according to the main claim of US 2014/0251 184 A1. You can continue as described in EP 0723997 A1, page 3 to page 4, are produced. The average thickness h 5 o the optionally be coated non-metallic platelet-shaped substrates is preferably in a range of 50 nm to 5000 nm, more preferably in a range of 60 nm to 3000 nm and most preferably in a range of 70 nm to 2000 nm. In one embodiment, the average thickness h 5 o, Gi as for glass plates as optionally be coated non-metallic platelet-shaped substrate in a range of 750 nm to 1500 nm, preferably in a range of 850 nm to 1400 nm, and particularly preferably in a range of 900 nm to 1300 nm. Thinner non-metallic platelet-shaped substrates lead to a lower total thickness optional to be coated of the, present invention, preferably to be used in a nail varnish composition, surface-modified effect pigments or surface-modified effect pigments according to claim 1. Thus, as a non-metallic platelet-shaped substrate preferably also glass flakes, the average thickness h 5 o, Gi as in a range of 50 nm to 700 nm, more preferably in a range of 101 nm to 600 nm, more preferably in a range of 160 nm to 500 nm and most preferably 200 nm is in a range to 400 nm. Range of 99 nm to 800 nm and most preferably in a range of 200 nm to 600 nm. Unfavorable effect pigments to be in an application. Standard deviation and average thickness h 5 o. The non-metallic platelet-shaped substrates can be optionally coated with at least one metal oxide, metal and / or metal oxide hydrate. This optional coating may comprise at least one highly refractive and / or at least one low refractive index layer. Under a high refractive index layer is a layer having a refractive index of n> 1, 8, preferably of n> 2.0 and particularly preferably understood by n> 2.2. Under a low refractive index layer is a layer having a refractive index of n <1, 8, and preferably n <1, 6 understood. For assignment in the high refractive index layer and low refractive index layer known from the literature refractive indexes are used. high refractive index layer may comprise at least one low refractive index layer composed of or containing at least one metal oxide, metal and / or metal oxide hydrate of the optionally present coating, wherein the metal ion from the group of metals consisting of Si, Al and B is selected. Unless high-index and low-index layers in the optional existing coating are present, it is preferred that they are present alternately. In one embodiment, at least one high refractive index and / or the at least one low refractive index layer can be doped with the doping metal oxides, metal hydroxides and / or metal oxide hydrates may include, the metal ion from the group of metals consisting of Al, Ce, Zr and Sn, preferably consisting of Al, Zr and Sn, is selected. The proportion of doping is preferably at a total of <1 wt .-%, more preferably at a total of <0.5 wt .-% and most preferably in a total of <0.2 wt .-%, each based on the total weight of the surface-modified effect pigments , In another embodiment, the optionally present coating can alternatively or additionally to the at least one metal oxide, metal and / or metal hydroxide layer comprising comprising at least one semitransparent metal layer. The metals of the semitransparent metal layer may be selected from the group consisting of Ag, Al, Cr, Ni, Au, Pt, Pd, Cu, Zn and Ti, preferably selected from the group consisting of Ag, Au, and Cu may be selected. Of course, the semi-transparent metal layer may also comprise alloys or mixtures of the metals listed above. The average thickness of the semi-transparent metal layer is preferably in a range of 1 nm to 30 nm, more preferably in a range of 4 nm to 26 nm, and particularly preferably in a range of from 7 nm to 21 nm. Metal hydroxides and / or metal oxide hydrates on. EP 2346950 A1, EP 2356181 A1, EP 2346949 A1, EP 2367889 A1. platelet-shaped substrates have an average particle size D 5 o μηη μηη to 360 from a range of 2. The D 5 o values of the present invention, preferably in a nail varnish composition to be used, surface-modified effect pigments based on non-metallic platelet-shaped substrates are preferably in a range of 3 μηη to 350 μηη, more preferably μηη in a range of 4 to 21 1 μηη, more preferably in a range of 6 to 147 μηη μηη, particularly preferably in a range of 7 μηι μηι to 99 and very particularly preferably in a range μηη 8-56 μηη. Most preferably comprise according to the invention, preferably to be used in a nail varnish composition which, on non-metallic platelet-shaped substrates has a D μηη surface-modified effect pigments based 5 o value from a range of 3 to 15 or μηη from a range of 10 to 35 or from a range of 25 to 45 μηη or μηη from a range of 30 to 65 or μηη from a range of 40 to 140 or from a range 135-250 μηη on. 65 μηη or μηη in a range from 75 to 1 10 degrees. Particularly preferably, the Dgo values ​​of the present invention, preferably to be used in a nail varnish composition, surface-modified effect pigments are based on non-metallic platelet-shaped substrates in a range of 8 μηη to 250 μηη or in a range of 10 μηη to 150 μηη or in a range of 40 μηη μηη to 70 or μηη in a range 68-1 10 μηη or μηη in a range of 120 to 180 μηη or in a range of 400 to 490 μηη μηη. Metal oxide coated metallic or non-metallic platelet-shaped substrate, and the average total thickness of the surface-modified effect pigment is determined based on a cured coating film, and in the effect pigments according to the invention, preferably to be used in a nail varnish composition, the surface-modified are aligned substantially plane-parallel to the ground. For this purpose a transverse section of the cured coating film under a scanning electron microscope (SEM) is examined, wherein the thickness of the metallic or non-metallic platelet-shaped substrate and the total thickness of the surface-modified effect pigment of at least 100 surface-modified effect pigments determined and statistically averaged. "Middle" with the concept according to the invention always refers to the h 5 o-value, unless otherwise indicated. used, surface-modified effect pigments which are not coated with a metal oxide, metal hydroxide and / or a metal oxide, the determination of the average thickness h 5 o preferred according to the WO 2004/087816 A2 (pages 24 and 25) the method described by SEM. Effect pigments according to claim 1, each based on metallic platelet-shaped substrates, with the device Cilas 1064 of Fa. Quantachrome or the Horiba LA-930 is determined from the company. Horiba. The evaluation of the scattered light signals carried by the Fraunhofer theory, which also includes refraction and absorption behavior of the particles. It has been shown that the inventive surface-modified effect pigments, shows good results in all nail polish systems, such as those disclosed, for example in EP 1796794 B2. Often the leafing effect in the application or thereafter is lost and consequently, the optical properties of effect pigments do not come completely to advantage. Therefore, an essential part of the present invention is to provide a nail varnish, in which the leafing properties of the surface-modified effect pigments very good effect. Here, regarding the number n can both pure forms of the monoester (n = 1) or di (n = 2) as well as mixtures thereof are present. In a particularly preferred embodiment for the surface modification of the to be used in an inventive nail polish composition effect pigments primary phosphoric acids or phosphonic acids having R = linear, unsubstituted alkyl group containing a carbon chain from a range of C12 to C18, preferably from a range of from C14 to C18 and R '= R "= H employed. more preferably, in this case n = 1 (monoester). Phosphoric acids are cetyl or stearyl. and / or Monoethylmono- (9Z) -9-octadecenylphosphorsäureester (CAS: 10483-96-2) Cetylphosphorsäureester (CAS: 3539-43-3), Stearylphosphorsäureester (39471 -52- 8 CAS) can be used. Particularly preferred are Cetylphosphorsäureester, Stearylphosphorsäureester or Laurylphosphorsäureester and more preferably are Cetylphosphorsäureester or Stearylphosphorsäureester and most preferably are Cetylphosphorsäureester. iii. R = linear and / or branched alkynyl group having a carbon chain from a range of C12 to C26, preferably from a range of C14 to C24, more preferably from a range of C16 to C22 and more preferably from a range of C18 to C20. In a preferred embodiment unsubstituted alkyl group having a carbon chain from a range of C12 to C20 are for the surface modification of the insertable in a nail varnish composition according to the invention the effect pigments fatty acids with R = linear, preferably used in a range of from C14 to C18. R = linear and / or branched alkyl radical having a carbon chain from a range from C6 to C23, preferably from a range of C7 to C20, more preferably from a range of Cs to C18 and R '= linear and / or branched alkyl group having a carbon chain from a range of C 1 to C 4, preferably from a range of C1 to C3, and more preferably from a range of C1 to C2, where the alkyl radical R, in other embodiments at least one substituent selected from the group consisting of -OH, -OCH3, -OC2H5, -NH 2, linear and / or branched alkyl radical having a carbon chain from a range of C1 to C6 may comprise. For the preparation of the invention, preferably to be used in a nail varnish composition, surface-modified effect pigments, the starting material (additive) is used for surface modification preferably in an amount in a range from 1, 5 wt .-% to 50 wt .-%, more preferably from a range of 3.2 wt .-% to 40 wt .-% and most preferably from a range of 4.8 wt .-% to 23 wt .-%, each based on the total weight of the effect pigment used, are used. Since the amounts of additive expressed herein are based on the starting material, the actual amount of additive of the finished coated effect pigment may be lower since, for example, can not pull up all the additive on the pigment surface in an amount of 50 wt .-%. Accordingly, smaller amounts of leafing additives in the pigments containing applications, particularly in nail polish can be found. The relatively high amounts of additives in the starting material create very high and dense coating of the effect pigment surface with the additive. platelet-shaped substrates which have been prepared by wet-milling and an average substrate thickness h 5 o from a range of 20 nm to 100 nm, at least one phosphonic acid of the formula RP (0) (OH) 2 with R = linear alkyl radical having a carbon chain from a range to Cu of Cs, in a total quantity preferably from a range of 4 wt .-% to 45 wt .-%, more preferably from a range of 5 wt .-% to 43 wt .-%, more preferably from a range of 6 wt .-% to 42 wt .-% and most preferably from a range of 9 wt .-% to 41 wt .-%, each based on the total weight of the effect pigment used used. Total amount by weight selected from a range of 5 wt .-% to 50 wt .-%, more preferably from a range of 6 wt .-% to 48 wt .-%, more preferably from a range of 7 wt .-% to 45th -% and most preferably from a range 10 wt .-% to 42 wt .-%, each based on the total weight of the effect pigment used used. Phosphonic may optionally be added to the final nail polish composition to large amounts of phosphonic acids. It is particularly preferred that the effect pigments are coated in a separate step with the phosphonic acid, before they are entered in the nail lacquer system. platelet-shaped substrates which can be prepared by wet milling or by PVD process with an average substrate thickness from a range from 20 nm to 90 nm at least one fatty acid in a total amount within a range of preferably 4 wt .-% to 28 wt .-% , more preferably from a range of 4 wt .-% to 25 wt .-%, more preferably from a range of 6 wt .-% to 20 wt .-% and most preferably from a range of 8 wt .-% to 17 wt .-%, based in each case on the total weight of the effect pigment used. platelet-shaped substrates which can be prepared by wet milling or by PVD process with an average substrate thickness from a range from 20 nm to 90 nm is at least a silane in a total quantity preferably from a range of 5 wt .-% to 39 wt .-% , more preferably from a range of 10 wt .-% to 35 wt .-%, more preferably from a range of 15 wt .-% to 32 wt .-% and most preferably from a range of 18 wt .-% to 30 wt .-%, based of the total weight of the effect pigment used, are used. platelet-shaped substrates which were prepared by PVD process with an average substrate thickness h 5 o from a range of 15 nm to 40 nm is preferably used from 20 to 40 nm. More preferably R '= R "= H is here is also particularly preferred that n = 1. Effect pigments used based on metallic platelet-shaped substrates which have been prepared by wet grinding with an average substrate thickness from a range from about 40 nm to 90 nm, preferably from 45 nm to 80 nm. More preferably R "here is = H. Moreover, it is particularly preferred that n = 1.
platelet-shaped substrates having a mean substrate thickness from a range from 20 nm to 90 nm. Phosphonic acid or is a mixture of at least one phosphoric ester and at least one phosphonic acid or a mixture of different phosphonic acids or a mixture of different fatty acids or a mixture of different silanes. The surface-modified effect pigments according to the invention of claim 1 can be used in cosmetic formulations, particularly in nail polish compositions. The surface-modified effect pigments according to claim 1 characterized in particular in nail polish compositions by their excellent leafing behavior. The invention is further directed to a nail polish composition, which allows the leafing effect of the effect pigments in an excellent manner and maintains. Embodiment, as a starting material (additive) for the surface modification of the optional coated aluminum pigment preferably at least one phosphoric acid ester R-0-P (0) (OR ') (OR ") where R = linear alkyl radical having a carbon chain from a range of Cu to Cie, R '= R "= H in a proportion selected from a range of 10 wt .-% to 50 wt .-%, based on the total weight of the effect pigment used, are used. The nail polish composition of this invention comprises the above-described surface-modified, optionally coated aluminum pigment preferably in a proportion selected from a range of 0.6 wt .-% to 3.0 wt .-%, more preferably from a range of 0.8 by weight % to 1 wt .- 9%, each based on the total weight of the nail polish composition. Effect pigments instead. Above the respective stated amounts of additives to large amounts of the additives can be added to the final nail polish composition, if necessary. It is particularly preferred that the effect pigments are coated in a separate step with the additive before it is entered into the nail lacquer system. As a solvent compatible with the inventive nail varnish solvent is preferably used. Butyl acetate is particularly preferred. In PVD metallic pigments or particularly thin, prepared by wet-milling metal pigments it will be on the drying step after iii. dispense and leave these pigments instead in a dispersion. A part of the additives used will not adhere on the surface of the effect pigment, since the surface is already saturated. However, for a high and uniform coverage, it is important to provide sufficient amounts of additive available, since a strong leafing effect only to be expected. Nail polish composition / overprinting in the direction of the painted subsoil are in adjoining this interfacial third of the nail polish composition. Preferably, the surface-modified effect pigments in the clear coat floating on and are oriented on the clearcoat surface. The surface-modified effect pigments are characterized therefore in the inventive nail varnish composition by a strong leafing behavior. coated non-metallic platelet-shaped substrates should be mentioned that herewith, may be obtained by application and drying nail polish compositions with a mirror finish. Ideally, nail varnish compositions according to the invention then have the application and drying to such a high image sharpness, so that a viewer can in almost mirror. Mirror finish to be perceived. The higher the numerical value of the gloss units at 20 ° geometry and the higher the numerical value of the Hazeeinheiten (Hlog), the higher the distinctness of image visually perceived of nail polish application. Gloss units more preferably at least 400 gloss units, most preferably at least 450 to 1500 gloss units, measured at 20 ° geometry, and at least 1200 Hazeeinheiten (Hlog), preferably at least 1300 Hazeeinheiten (Hlog), more preferably at least 1400 Hazeeinheiten (Hlog) and most preferably at least 1410 to 2000 Hazeeinheiten (Hlog) on. Also in this embodiment, a higher numerical value of the Hazeeinheiten (Hlog) is measured at the 20 ° geometry at a lower numerical value of gloss units, are preferred. Aluminum flakes, the aluminum flakes μηη a D 5 o-value from a range of 2 to 500 μηη, preferably from a range of 2.5 μηη to 90 μηη, and an average thickness in a range from 15 nm to 1000 nm, preferably from comprise a range of 18 nm to 60 nm. μηη wet film thickness of 100 and subsequent drying at room temperature of at least 200 gloss units as measured at 20 ° geometry, and at least 1200 Hazeeinheiten (Hlog) on. Nail polish composition at least one surface-modified effect pigment in a proportion selected from a range of 0.1 wt .-% to 8.4 wt .-%, preferably in a proportion selected from a range of 0.15 wt .-% to 6.9 wt %, particularly preferably in a proportion selected from a range of 0.2 wt .-% to 4.3 wt .-%, each based on the total weight of the nail polish composition, at least one hydrocarbon-containing resin and at least one solvent. Below a binder content of 25 wt .-% no good optical effects due to the effect pigments in the applied nail varnish could be seen more. Above 60 wt .-%, the optical quality of the effect pigments can also gradually increasing the viscosity of the nail polish compositions of the present invention becomes too high. The nail lacquer compositions according to the invention preferably comprise as binder hydrocarbon resins having an average molecular weight (M w) from a range of 800 to 6000, preferably from a range from 900 to 5000, or from a range of 8,000 to 10,000, preferably from a range from 8500 to 9300. the average molecular weight Mw was measured by gel permeation chromatography (GPC) with a polystyrene standard. Hydrocarbon resins are in most organic solvents, eg. For example, esters, ethers, chlorinated hydrocarbons and aromatics soluble. Without being bound by theory, the inventors suspect that in the use of polar binders coated with suitable additives effect pigments are still partially wetted by the binder and therefore do not have the desired leafing effect. However, the resins of the nail varnish composition according to the invention are very nonpolar and therefore do not wet the effect pigments. Thus, the Effektpiqmente can form the leafinq effect better. In preferred embodiments, nail polish compositions are used containing aromatic hydrocarbon resins. include hydrocarbon resins such as Kristalex F100 Hydrocarbon Resin, Kristalex 5140 Hydrocarbon Resin, Kristalex 3070 Hydrocarbon Resin, Kristalex 3085 Hydrocarbon Resin, Kristalex Hydrocarbon Resin F1 15, respectively Fa. Eastman. Nail Polish Composition hydrocarbon-containing resin in an amount 80 to 100 percent by .-%, more preferably 90 to 99 wt .-% of the total organic binder. Binders. These binders have rather proved to be a hindrance to achieve a really strong mirror effect. Nail polish compositions containing the above-mentioned binders, these at least partially wet by virtue of their increased polarity, the effect pigments and exhibit this leafing characterized poorer properties. The nail varnish compositions according to the invention preferably contain certain solvents. As the solvent, the nail polish compositions of the invention ethyl acetate, butyl acetate, isopropanol can be added. Preferably the nail polish composition of the invention contains as the solvent a mixture of isopropanol, ethyl acetate and butyl acetate. It is irrelevant whether these preferred solvents are entered via the cement or the effect pigment dispersion. In further preferred embodiments in this solvent mixture, the ratio of butyl acetate to the solvent mixture from 50 to 99 wt .-% and particularly preferably 55 to 98.5 wt .-% by weight. Isopropanol to 20 wt .-%, preferably below 15 wt .-%, and more preferably below 10 wt .-%, each based on the entire solvent. At high levels of isopropanol in the inventive nail varnish composition lead to poor visual appearance of the effect pigments. Presumably, this is due to too rapid drying of nail polish after application. subsequent drying a homogeneous film on a human or artificial fingernails and / or toenails. Effect pigments can not be optimally oriented, resulting in a reduction to loss of specular gloss. The nail varnish compositions according to the invention may additionally contain one or more additional ingredients. Here plasticizers and antioxidants are, in particular. are propylene glycol and in particular propylene glycol phenyl ether, propylene glycol diacetates, Dipropylenglycolbutylether, Tripropylenglycolbutylether, propylene glycol methyl ether, Dipropylenglycolethylether, tripropylene glycol methyl ether and diethylene glycol methyl ether, Propylenglycobutylether, or mixtures thereof be used. Tributoxyethylphosphate or tartrates, especially dibutyl tartrate; Adipates, carbonates, sebacates; Benzyl benzoate, butyl acetyl, Glycerylacetylricinoleat, butyl glycolate, camphor, Glyceroltriacetate, N-ethyl-o, p-toluenesulfonamide, oxyethylene thereof compounds such as Oxyethylenöle, in particular vegetable oils, such as castor oil, hydrocarbon oils and mixtures thereof. Preferred plasticizers are especially hydrocarbon oils. The weight fractions of plasticizers preferably be on the entire nail polish composition ranges from 0 to 15 wt .-%, more preferably from 1 to 10 wt .-%, and particularly preferably from 5 to 10 wt .-%. Zinc dibutyldithiocarbamate (PERKACIT ZDBC. (Messrs. Performance additive Italy SpA). The antioxidants are preferably used in amounts from a range of 0 to 5 wt%, more preferably used in a range of 0.05 to 1 wt .-%, based on the total nail lacquer composition. The nail polish composition of the invention may further comprise customary other additives, as they are known in the art. Wetting agents, antifoaming agents, perfumes, neutralizing agents, thickeners, UV blockers humectants, vitamins, proteins and mixtures thereof. In further embodiments, the nail polish composition of the invention preferably does not contain anti-settling agents. Eventual Settled surface-modified effect pigments can be dispersed again, amazingly, most likely, without the addition of anti-settling agents by simply shaking. Hydrocarbon resins as a binder and a mixture of isopropanol, ethyl acetate and butyl acetate as a solvent, said solvent mixture from 70 to 100 percent by .-% of the total solvent of the nail polish composition. Nail polish composition account. are also preferred herein as leafing additive Phosphorsäurecetylester or Laurylphosphonsäure used. ii) dissolving the hydrocarbon resin in a solvent or solvent mixture, iii) mixing and homogenizing the dispersion of i) with the binder solution according to ii). Dissolving the hydrocarbon resin in a solvent is preferably carried out in a mixture of at least two, preferably three solvents. a mixture of isopropanol, ethyl acetate and butyl glycol is particularly preferably used. In other preferred embodiments, the solvent of step i) is also made thereof from isopropanol, ethyl acetate and butyl glycol or a mixture, in order not to write further, potentially interfering solvent in the nail polish. Furthermore, it is preferable to select in the selection of the metallic effect pigments, those which are present in a paste or a dispersion of the preferred solvents of isopropanol, ethyl acetate and butyl glycol, as the solvent of the metal effect pigment paste is also applied in small amounts in the inventive nail polish, if not complex Umnetzungsschritte be used. b) optional subsequent coating of the nail enamel with a clear lacquer. Nail varnish. Due to the pronounced leafing effect of the effect pigments in nail polish this naturally has a rather poor abrasion resistance. produce surface. This procedure is recommended if the Finder nails have a high roughness. The subsequent coating with a clear varnish in step b) can be carried out with the same or a different clearcoat as the nail lacquer of the invention. However, this clear coating contains no circumstances effect pigments, since they would overlap the desired effect of the inventive nail varnish. Abrasion resistance of the nail varnish composition according to the invention to increase. Preference is also solvent-based clear coats can be used. Without being bound by theory, the clearcoat is preferably based on polar binders that interact only slightly with the hydrocarbon resins of the clearcoat of the invention. In particularly preferred embodiments, based on these clearcoats binders such as polyvinyl butyral (PVB), polyvinylpyrrolidone (PVP) or mixtures thereof. Liability resistance on the inventive nail polish. are effect pigments according to claim 1 or 2 used in in other cosmetic applications. These include, for example, body powder, face powder, pressed or loose powder, powder cream, eye makeup such as eye shadow, mascara, eyeliner, liquid eyeliner, eyebrow pencil, lip balm, lipstick, lip gloss, lip liner, hair styling compositions such as hair spray, hair mousse, hair gel, hair wax, hair mascara , permanent or semi-permanent hair colors, temporary hair color or skin care compositions such as lotions, gels, emulsions. Total concentration of surface-modified effect pigments according to the invention in the cosmetic formulation may range from 0.001 wt .-% for rinse-off products and 40.0 wt .-% for leave-on products, based in each case, lying on the total weight of the formulation. Percentages by weight. The terms NFA (non-volatile content) solids content and solids content are used interchangeably. METALURE A 41506 EN (dispersion in ethanol, solid content 15%, D 50 (Horiba LA- 930) = 5.5 to 6.5 μηη μηη, Fa. 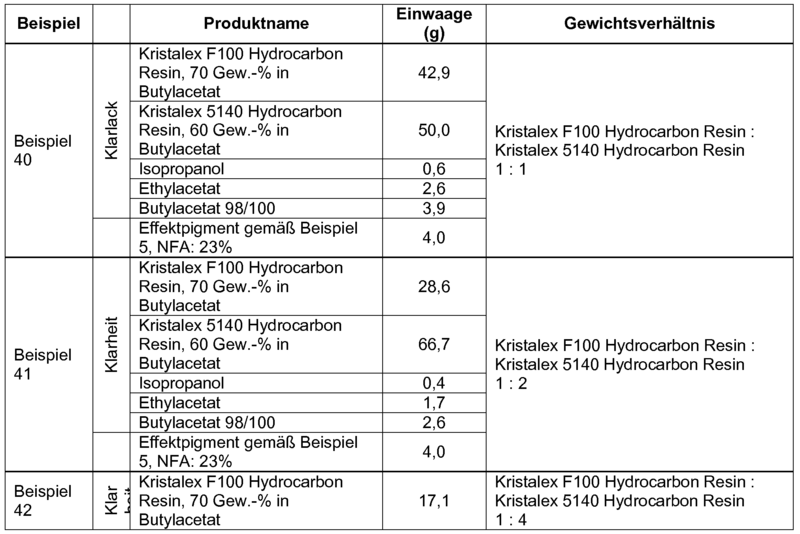 ECKART GmbH) according to the following in 300 g of solvent Table 3 at 200 rpm / min dispersed and heated to 40 ° C. Subsequently, the additive was added according to the following Table 3 in 30 g of the corresponding solvent to the aluminum effect pigment dispersion. After 6 hours of stirring at 90 ° C the mixture was cooled and filtered through a Buchner funnel. In each case, surface-modified aluminum effect pigments as a 10-20% dispersion obtained, which after incorporation into the clear coat according to IIa (pigment concentration: 0.4 wt .-%, based on total weight of the clear varnish), application to an artificial fingernail and subsequent drying a nail varnish were with mirror-like gloss. 2) Phosphorsäurecetylester, CAS Number: 3539-43-3, from Clariant..
(Pigment concentration: 0.4 wt .-%, based on total weight of the clear varnish), application to an artificial fingernail and subsequent drying gave a nail polish with mirror-like gloss. Total weight of the clear paint) application resulted in a nail polish on a artificial fingernail and then drying, the optical appearance was attributable to the respectively employed effect pigment. 4> aluminum effect pigment paste, solid content 23 to 27%, Dso (Cilas 1064) = 12 to 18 μηη GmbH μηη, Fa. ECKART. Comparative Example 1 a nail varnish without mirror-like gloss with matte gray aluminum yielded. 7> 1-Hexadecanolphosphat, 2,2'-lminobis [ethanol] 1: 1, CAS 69331-39-1, from DSM..
Clear coat), application to an artificial fingernail and subsequent drying a nail varnish without mirror-like gloss, however, a nail polish with matte gray aluminum yielded. 9) mono-, di- and tri- (alkyltetraglycolether) -o-phosphoric acid ester, CAS-Number: 19415-05-3 1, Clariant..
0) mono-, di- and tri- (alkyltetraglycolether) -o-phosphoric acid ester, CAS-Number: 158-63-2 121; 121158-61-0; 121158-62-1, Fa. Clariant. obtain surface-modified aluminum effect pigments as a 55-65% dispersion, which after incorporation into the clear coat according to IIa (pigment concentration: 1, 5 wt .-%, based on total weight of the clear varnish), application to an artificial fingernail and subsequent drying a nail varnish without mirror-like gloss and / or showed no leafing effect. > Kaliumhexadecylhydrogenphosphat, CAS 19035-79-1, Hostaphat CK 100; Fa. Clariant. PVD aluminum pigment dispersion in ethyl acetate METALU RE A-41010 AE, ECKART GmbH, NFA:. 10%, D 50 = 9.50 μηι μηι to 10.50. PVD aluminum pigment dispersion in ethyl acetate METALU RE 55350 L-AE, ECKART GmbH, NFA:. 10%, D 50 = 1 1, 00 μηι μηι to 12.00. Aluminum pigment paste SI LVERSHI NE S2100, ECKART GmbH, NFA. 48.0% to 52.0%, D 50 = 17.0 m to 23.0 μηι. Mixture of 13 wt .-% RE METALU A-41010 AE, Fa. ECKART GmbH and 0.2 wt .-% Hostaphat CS 120, Fa. Clariant. In a suitable stirred vessel, a 70 wt .-% strength binder solution was prepared F100. For this purpose, 30 g of butyl acetate 98/100 (Getzmann GmbH Fa.) Were charged, with stirring and cooling (12 ° C) with the Dispermat CnF2 added 70 g of the binder Kristalex F100 Hydrocarbon Resin (Fa. Eastman) followed by 30 minutes at 3000 stirring to 4000 rpm / min. In a second suitable stirred vessel, a 60 wt .-% strength binder solution 5140 was prepared, For this purpose, 40 g of butyl acetate 98/100 were submitted, while stirring and cooling (12 ° C) with the Dispermat CnF2 (Fa. 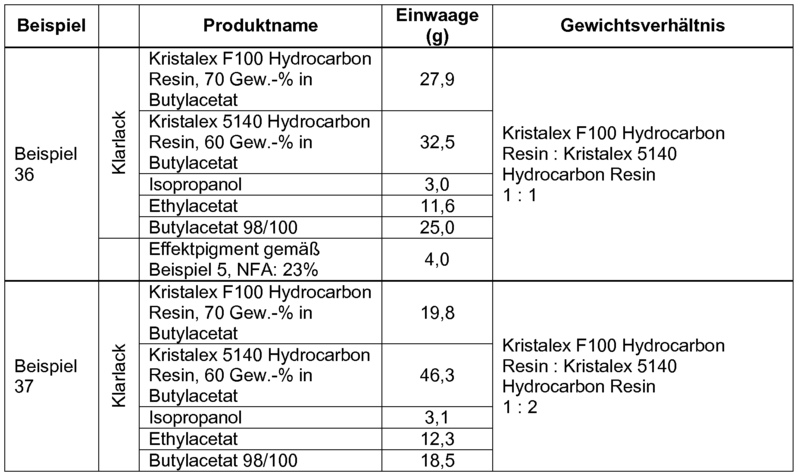 Getzmann GmbH) 60 g of binder Kristalex 5140 hydrocarbon Resin (Fa. Eastman) was added and then stirred for 30 minutes at 3000 to 4000 rpm / min. 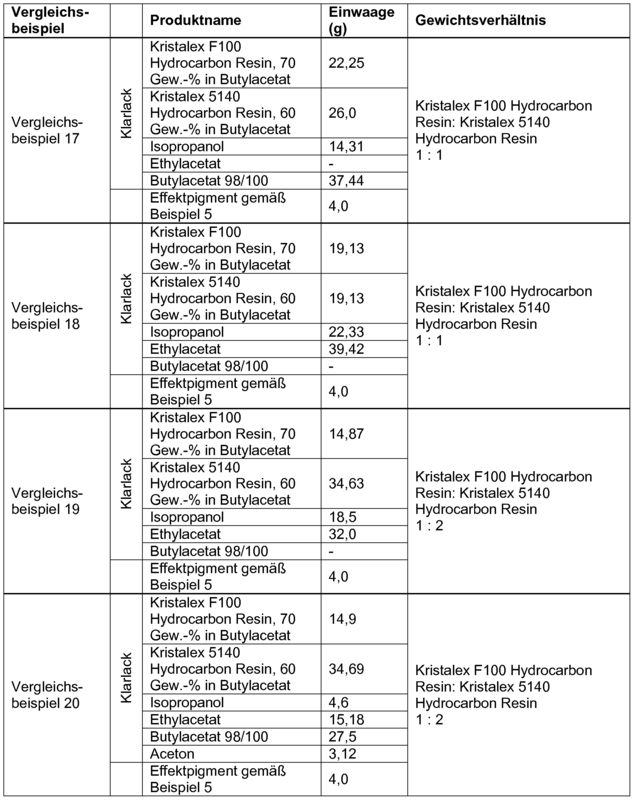 The nonvolatile content (binder solids) of the binder solutions described above was performed according to DIN EN ISO 3251: sets of 2008. For the preparation of the clear coat comprising 70 wt .-% strength binder solution F100 and 60 wt .-% strength binder solution table 5140 according to the following with stirring at 900 rpm / min with the laboratory stirrer IKA RW 20 Digital (Fa. IKA) were combined at room temperature and stirred for 5 to 10 minutes. 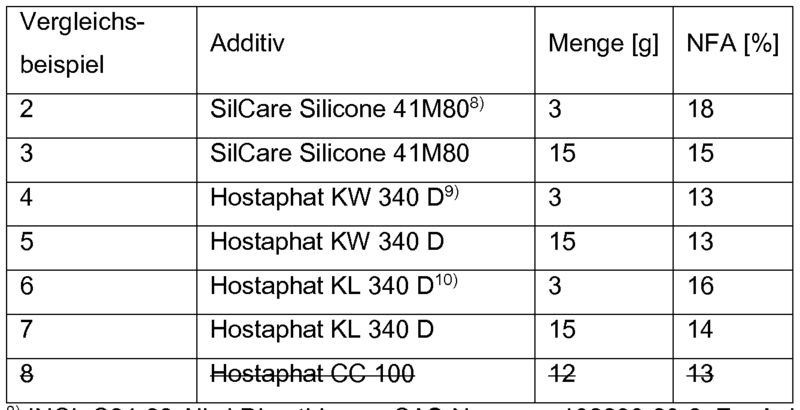 The solvents were then added according to the table below respective successively under stirring at 600 rpm / min. submitted following tables 9, 10 and 1 1 and 96 g of clear lacquer was added with stirring at 600 rpm / min. Total weight of the clear coat on. Table 10: The nail varnish compositions according to the invention of Examples 36 to 39 had a binder solids content of 40 wt .-%, based on the total weight of the clear coat on. Total weight of the clearcoat. For the inventive nail polish compositions of Examples 44 to 48 d Preparation of the clearcoat was as described above with IIa. For preparing the nail varnish compositions according to the invention of Examples 44 to 48 4 g of the respective surface-modified effect pigment according to the following Table 12 were introduced and 96 g of clear lacquer was added with stirring at 600 rpm / min. For the inventive nail polish compositions of Examples 49 to 64 the preparation of the clear paint as shown in Table 13 was carried out as described above under IIa. For preparing the nail varnish compositions according to the invention of Examples 49 to 64 the respective surface-modified effect pigment according to the following Table 14 was charged and the clear lacquer is added from Table 13 according to Table 14, with stirring at 600 rpm / min. The nail lacquer compositions according to the invention of Examples 50-66 had a binder solids content of 40 wt .-%, based on the total weight of the clear coat on. 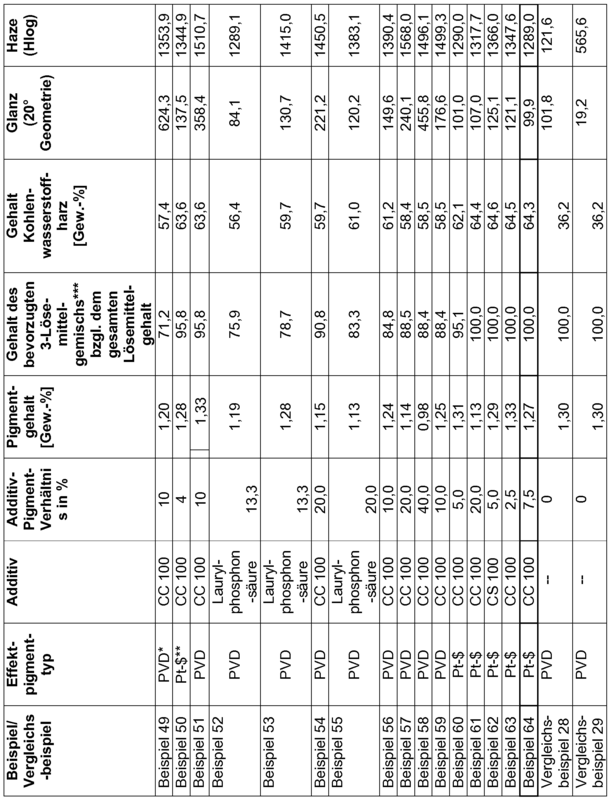 Nail polish compositions of Comparative Examples 18 to 20 were submitted to 4 g of the respective surface-modified effect pigment according to the following Table 15 and 96 g of clear lacquer was added with stirring at 600 rpm / min. Examples of the invention and the comparative examples also Table 18 can be removed. 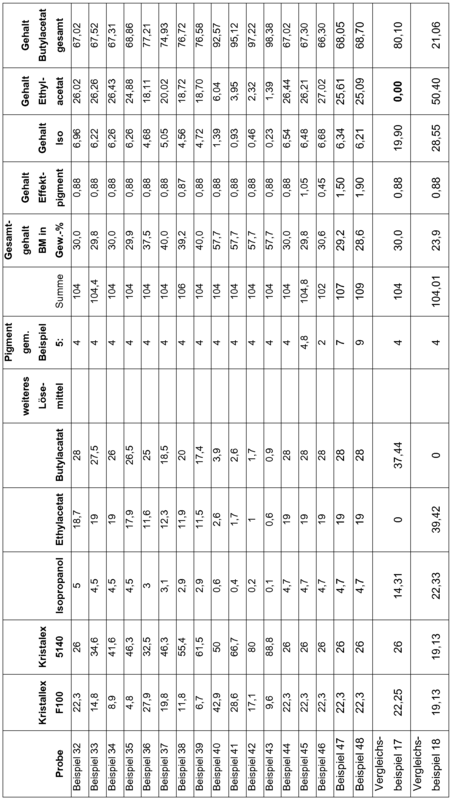 Nail polish compositions of Comparative Examples 21 to 24 were submitted to 4 g of the respective surface-modified effect pigment according to the following Table 16 and 96 g of the clear lacquer, while stirring at 600 rpm / min. 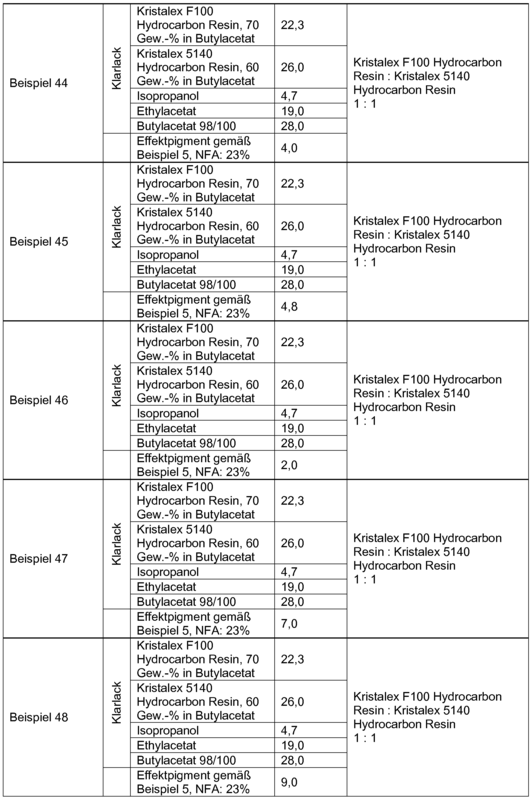 Binder solids content of 20 wt .-%, based on the total weight of the clear coat on. The nail lacquer compositions of Comparative Examples 21 to 24 showed, after application to an artificial fingernail and subsequent drying a significantly poorer visual appearance than the applied nail varnish applications according to the invention, presumably due to the too low a binder solids content of about 20 wt .-%, based on the total weight of the clear paint is due. The surface-modified effect pigment has been wetted by the presumably existing in the clearcoat solvent, which is why the effect pigment could not be oriented to the surface of the clear coat during or after application. Table 18 shows the calculated compositions of the inventive examples and the comparative examples with the variation of nail polish parameters are concerned (with always the same effect pigment of Example 5) are summarized. Manufacturer determined. To this was added approximately 0.1 g of the respective pigment as an aqueous suspension without the addition of dispersing, with continuous stirring by means of a Pasteur pipette into the sample preparation cell of the measuring device and measured several times. From the individual measurement results, the mean values ​​were formed. was carried out by the Fraunhofer method, the evaluation of the scattered light signals. to be used in nail polish composition, surface-modified effect pigments, the surface-modified effect pigments according to Claim 1 and the pigments of the comparative examples, each based on metallic platelet-shaped substrates, was, with the device Cilas 1064, Fa. Quantachrome, or the Horiba LA-930, Fa. Horiba each measured according to manufacturer's instructions. For this purpose, about 50 ml of the respective pigment were suspended in isopropanol 300 seconds in the ultrasonic bath (instrument: Sonorex IK 52, Bandelin.) And then added via Pasteur pipette to the sample preparation cell of the measuring device and measured several times. From the individual measurement results, the mean values ​​were formed. was carried out by the Fraunhofer method, the evaluation of the scattered light signals. With regard to the visual appearance of the effect pigments according to the invention, preferably to be used in a nail varnish composition, the surface-modified or surface-modified effect pigments according to claim 1 is a small value of AD, ie, a narrower chip preferred. The determination of the average thickness h 5 o the present invention, preferably to be used in a nail varnish composition, surface-modified effect pigments, the surface-modified effect pigments according to claim 1 as well as the pigments of the comparative examples was carried out according to the WO 2004/087816 A2 (pages 24 and 25) the method described by means of SEM. Fixed samples measuring cups fixed and measured it. When measuring the device Advantix ARL, Fa. Thermo Scientific served. For objective determination of the optical appearance of the nail varnish compositions according to the invention as well as the nail polish compositions of Comparative Examples each nail lacquer composition by means of a doctor blade (Filmapplicator Erichsen system Wasag Model 288, Fa. Erichsen) was μηη in a wet film layer thickness of 1 10 applied to glass plates and then dried at room temperature. From the so-applied nail polish compositions of the gloss value (20 ° geometry), and the haze value (Hlog) with the device has been haze gloss (Fa. BYK Gardner) measured. Geometry) and Haze (Hlog) listed. to look at each other. Thus, a nail polish composition having a high haze and simultaneously a low gloss value may still have a mirror-like effect. The nail lacquer compositions according to the invention of Examples 48-64 showed a pronounced after application leafing behavior up to a mirror-like effect. The optical quality nail polish applications with excellent mirror effect trained thereby were coated by the use of PVD pigments, with Phosphorsäurecetylester (Hostaphat CC 100) was obtained (Examples 49, 51, 54,56,57,58 and 59). The nail lacquer compositions of Comparative Examples 27 to 30, in which no additive was used, however, showed no leafing effect and in some cases even a strong speck formation after application. Accordingly, poor fell from the gloss and haze values. In Comparative Example 25, the potassium salt of Cetylphosphorsäureesters was used, which is unfavorable. * Here are abbreviated simply as "PVD" all PVD pigments that further details be taken to the corresponding previous tables. ** By "Pt $" all wet-milled pigments Further details will be designated with an average thickness of less than 100 nm in this table. Gather to the corresponding previous tables. *** mixture of ethyl acetate, butyl acetate and isopropanol. according to b) is prepared by PVD process, and a D 5 o-value from a range of 2.5 to 90 μηι μηι has. iii. Filtering, optionally drying, the in accordance with step ii. obtained surface-modified effect pigment. R = linear and / or branched alkyl radical having a carbon chain from a range of from C10 to C20 and R '= R "= H, linear and / or branched alkyl radical having a carbon chain from a range of O to Ce, O preferably up to C3, wherein R 'and R "may be identical or different from each other. Laurylphosphonsäureester and particularly Laurylphosphonsäure is used. 8) nail polish composition according to any one of claims 4 to 6, being used as effect pigment a PVD aluminum pigment, and as a raw material (additive) for the surface modification of the substrate or the coating Cetylphosphorsäureester. 9) nail polish composition according to any one of claims 4 to 8, wherein the hydrocarbon resin is 80 to 100 percent by .-% of the total organic binder. Coals hydrogen resins in a range of 25 wt .-% to 64 wt .-%, based on the total nail lacquer composition is. Mixture of isopropanol, ethyl acetate and butyl acetate. 13) nail polish composition according to claim 12, wherein the solvent mixture of isopropanol, ethyl acetate and butyl acetate 70 to 100 percent by .-% of the total solvent. 14) nail polish composition according to any one of claims 12 or 13, wherein the ratio of isopropanol to 20 wt .-%, preferably below 15 wt .-%, based on all of the solvent is. Vitamins, proteins and mixtures thereof. (16) nail polish composition according to any one of claims 4 to 15, wherein the nail polish composition μηι after application to a glass plate using a doctor blade at a wet film thickness of 100 and subsequent drying at room temperature of at least 150 gloss units as measured at 20 ° geometry, and at least 1200 Hazeeinheiten Hlog ) having. iii) mixing and homogenizing the dispersion of i) with the binder solution according to ii). Lip balm, lipstick, lip gloss, lip liner, hair styling compositions such as hair spray, hair mousse, hair gel, hair wax, hair mascara, permanent or semi-permanent hair colors, temporary hair color or skin care compositions such as lotions, gels, emulsions. is carried out with a nail polish lösemittelbasierendem clearcoat, which consists in binders of the group consisting of polyvinyl butyral, polyvinyl pyrrolidone and mixtures thereof.